The same Reader’s Digest collection of music for children that introduced me to Grieg (see post of 17 March) also introduced me to Igor Stravinsky, more specifically to his Firebird Suite. In 1909, when he was twenty-seven years old and a relative unknown, Stravinsky was commissioned by Serge Diaghilev, of Les Ballets Russes, to write the score for a ballet, The Firebird. The work was performed for the first time in Paris on 25 June 1910 and was an immediate success. Stravinsky’s reputation was established and he went on to collaborate with the company on more ballets, including Petrushka and The Rite of Spring, the latter of which incited riots and turned the music world on its head when it premiered 100 years ago this May. 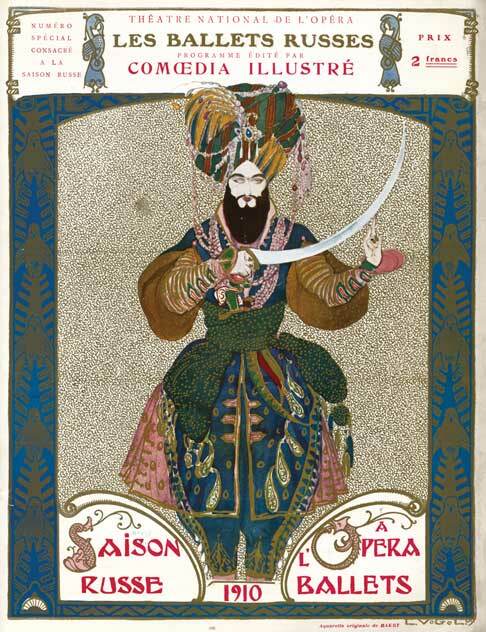 Cover of the official program for Ballets Russes, Theatre National de l’Opera, Paris (1910). The Firebird, based on Russian folk tales, tells the story of Prince Ivan who, while wandering in an enchanted forest, encounters the magic Firebird—half bird, half woman—as it picks golden fruit from a silver tree. He captures her, but then takes pity and sets her free. In gratitude, the Firebird gives the Prince a flaming feather. It has magic powers, she tells him; if he needs help or finds himself in danger, all he needs to do is wave the feather and she will come to his aid. Ivan then enters a garden near the castle of the evil magician Kastchei. Thirteen princesses, all prisoners of the magician, are dancing and playing in the garden; Ivan falls in love with the most beautiful of the princesses. At daybreak, the princesses must return to their prison, and they warn Ivan not to follow, lest he, too, fall under the magician’s spell. Ivan does follow, though, and when the gates of the castle open, Kastchei and his band of henchmen burst out in a wild dance. 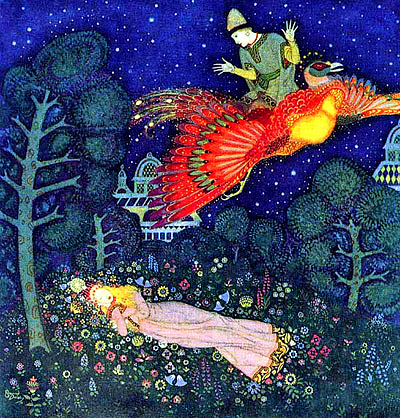 Using the magic feather, Ivan summons the Firebird, who appears and puts the evil spirits to sleep with a lullaby. In the end, all the princesses are freed from the spell and Ivan and marries his beloved in a grand ceremony. 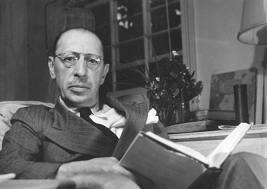 In addition to the full score for the ballet, Stravinsky arranged the music into three different suites for orchestra (in 1911, 1919, and 1945). Stravinsky’s music is so effective at conveying a range of color, mood and atmosphere, that The Firebird‘s story is vividly told, even in the absence of dancers, costumes, lighting, and backdrops. There are many fine recordings of The Firebird Suite, but for this post I thought I’d offer Stravinsky himself–82 years old, with a cane at his side–conducting a performance of the 1945 Suite. This particular video includes the last two movements/sections: the lullaby (Berceuse) and the triumphant Finale. I hope you’ll watch the entire video–better yet, I hope some of you will be inspired to seek out, and listen to, a full recording–but the particular moment I wanted to highlight here comes in the Berceuse. Starting at 0:58, the bassoon and the oboe begin trading mournful solos; at 1:56, we hear the cello. And then, at 2:06, magic: a glissando on the harp and a flurry of strings, and we’re in a different key. It gives me a frisson of joy every time I hear it. But don’t stop there! At 4:23 the French horn announces the final theme, the strings take it over, and from 5:22 on I’m goose-flesh from head to toe. (Even the rather dour maestro can’t help suppressing a smile or two in this sequence). This was all thrilling to me as a child and, happily, it still is. Related tidbit: Between 12 May and 2 September, the National Gallery in Washington, D.C. will be mounting an exhibit called Diaghilev and the Ballets Russes, 1909-1929: When Art Danced with Music.